For a gated community that is both beautiful and convenient, Cross Creek offers more than most. This safe and tranquil suburban beauty is located on Airline Drive in North Bossier, and has neo-eclectic 1 and 2 story houses built in the nineties and early 2000’s. These charming homes are adorned with gardens, well-kept yards, and architectural accents that make it both charismatic and inviting. 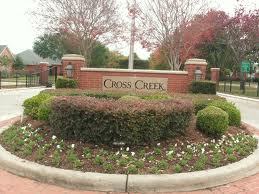 Being located on Airline Drive, Cross Creek has one of the best locations for suburban living in Bossier City. It is a stone’s throw from the I-220 loop which provides unparalleled access to Harrah’s racetrack in Haughton, all the way to Downtown Shreveport, Cross Lake, I-20, and the regional Airport. Airline Drive is not only home to the most in-demand shopping and dining destinations, but it is also adjacent to Willis-Knighton Bossier hospital, the city’s premier medical facility. The schools in the area are also top-notch, both public and private. The recreational opportunities near Cross Creek are almost limitless. With Cypress Black Bayou only a short drive away, as well as the Red River, and Lake Bisteneau, there is always something in the way of camping, fishing, water sports, or just relaxing by the lake. Cross Creek is one of the best and safest gated subdivisions on Airline Dr. and perhaps all of Bossier City, making it a neighborhood you will not want to pass up.